Every year, it is becoming more and more evident just how important ancillary revenue is for airlines. 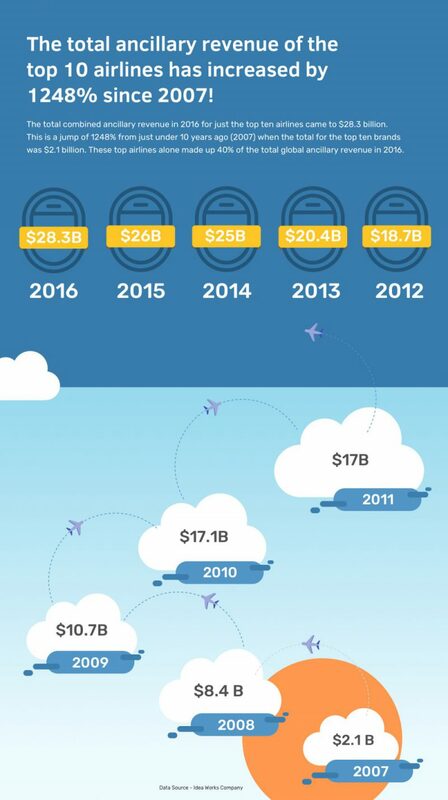 From the increase in products and services offered to passengers to the larger portion of space ancillary revenue is taking up in airlines’ financial statements, it is obvious that major airlines have gotten on board (pun intended) with the notion that ticket sales alone will not create a winning brand. This past year, the total combined ancillary revenue for just the top ten airlines came to $28.3 billion. This is a jump of 1248% from just under 10 years ago (2007) when the total for the top ten brands was $2.1 billion. In 2016, the top five brands made over $21 billion alone. These top 10 brands accounted for over 40% of the total global ancillary revenue for 2016 which was $67.4 billion. Year over year, the top 10 airlines bringing in ancillary revenue tend to stay the same with a few airlines swapping spots. In 2016, Air Canada climbed its way onto the top 10 list, nudging Alaska Air out of the list.